I was introduced to Roberta Bolduc soon after I arrived at Bay Path. As Roberta had attended a women’s college as an undergraduate, she immediately bonded with the mission of Bay Path. Roberta joined the Advisory Council in 1996, and eventually became a member of the Bay Path Board of Trustees. From the beginning, Roberta and her husband, Bob, wanted to help our students and soon established the Pride Stations and Stores Scholarship, followed by the Bolduc Family Endowed Scholarship. When we were first considering building a health science center, Roberta was a strong advocate for this project. 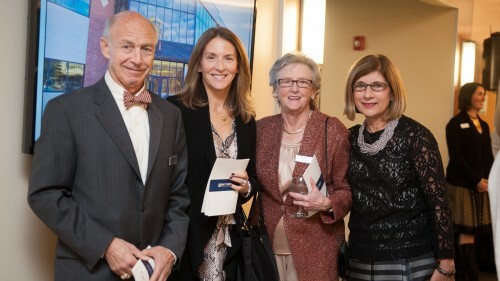 Without hesitation, she and Bob stepped up to support the fundraising campaign and the Center Hall Atrium have been named in their honor for their generosity. Throughout Roberta’s tenure as a trustee, she has always had a keen focus on academics. In fact, when she became Chair of the Board of Trustees in 2010, one of the first things she did was to sit in for a class in Children’s Literature. She wanted to observe and participate in the student experience. This willingness to become involved also extended to one of the great passions of her life—golf. She began the sport as a teenager playing with her father, and it has been a constant presence in her life. She played competitively, and also worked and volunteered at the administrative levels of the sport. In time, she would become Chairman of the United States Golf Association's Women's Committee, and also be inducted in the first class for the Western Massachusetts Golf Hall of Fame. 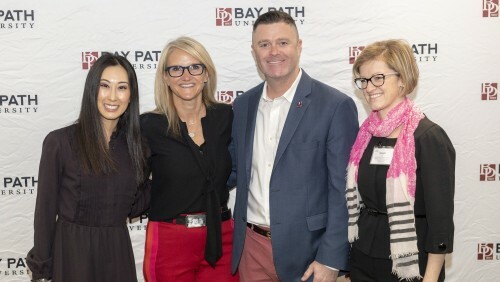 Roberta, in whatever she does, gives you her whole self, and for that, Bay Path and I are extremely grateful. Could you share a bit about your life journey and career? I was seventeen months old before I first saw my father. He had been serving in the European Theatre in WWII. My parents were both teachers by profession, but my father continued his military service after the war. My brother and I grew up as "military brats." We moved every couple of years and endured times when the family was separated. It was not the easiest life at the time, but in retrospect, I would not trade it for anything. I am very proud of what we all contributed in service to our country. When we were stationed in Kansas, it was time for me to think about college. I considered going home to Massachusetts to attend college, but ultimately I chose Marymount College in Kansas. I had the idea that I might transfer when my father retired. Marymount was a small, Catholic women's liberal arts college. I loved it there and stayed for four years, the first time in my life that my schooling wasn’t interrupted by a move. My marriage to Bob eventually took me back to Massachusetts and teaching. After Bob's service in Viet Nam, I became a "stay at home mother." I knew that I needed to contribute to my community, and so began my career as a wife, mother, and volunteer. I was always taught that it was important to do one's very best, and I think that was a driving force in my life. I have tried to contribute where I could to make a difference. I am proud to have been involved with many nonprofit organizations, including being a founding director for the Ronald McDonald House of Springfield. I have now been involved with the Ronald McDonald House for 25 years. Other organizations I have volunteered for include Stage West, Baystate Health Foundation, and, of course, Bay Path University. It has been incredible to work under Dr. Leary’s inspiring leadership. My own college closed several years ago, and I feel that my time spent at Bay Path is a repayment for my wonderful experiences at Marymount. I am also very proud that in my favorite pastime I became a qualified Rules Official for the United States Golf Association and served as a representative of the USGA at major events on five continents over the years. What is one regret that you have in your career? But I do have one small regret and that is that I didn’t spend more time with my grandmother. She lived to be almost 110 with a clear mind to the very end. I wish I had asked her more questions about her life that began in 1877. She saw incredible changes in the world. What advice would you give to students at Bay Path who are setting out on their own life journey? In offering advice, I try to think of what I have said to our daughter. Try to make good choices, work diligently, and be a good person. Always be a lifelong learner, and be curious. Smile and go out of your way to be polite. Love and respect people. Make good friends and treasure them. Know yourself and trust your instincts. I also think it is important to find something that you do for yourself that brings you enjoyment and satisfaction, a hobby or sport. Sometimes a person needs a little restorative activity to lift the spirit and recharge the batteries.